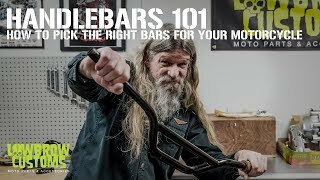 Club style has gotten plenty of play in recent years on tough-guy TV shows, but the truth is far less silly or sensational: flat bars with tall risers are really comfortable during long, fast days in the saddle. To satisfy bikeriders who prefer this setup, Biltwell introduces their Murdock risers. 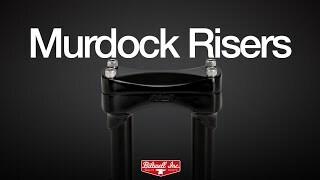 Available in 6-, 8- and 10-inch heights, Murdock risers feature investment-cast steel top clamps and lower threaded bases, and are connected by two 1-inch O.D. x 0.120" (3mm) wall seamless 4130 chromoly tubes. After TIG welding the finished unit is hand polished and triple chrome or satin black plated for style and durability. The threaded bases on Murdock risers are on 3.5" (89mm) centers to fit most stock and aftermarket H-D triple trees with removable bar clamps. Of course, the bolt pattern on the Biltwell Murdock riser's one-piece handlebar clamp fits stock H-D speedo and tach brackets.